Important entries are marked with an *. Howerd, Robert E. - Kull, Conan,* and Bran Mak Morn cycles. Merrit, A. - The Moon Pool, "the People of the Pit"
A note on Shaver: I've read a lot about him and tend to work quite a bit of the ideas from his work into my games already; however, for this project I think I might actually want to tackle reading him in his own (heavily edited) words. Whelm sloars are strange creatures found in worlds that exist solely in the minds of madmen, artists, and hashish blinded scholars. They are allowed purchase into this world only when particularly talented people of this sort are, due to some miraculous breakthrough or mental breakdown, are able to fully realize the world that only exists in their minds. The warning signs of this process are many, but the most obvious is that the affected individual will spend hours in seclusion drawing maps, writing essays, and describing creatures and peoples from a world unknown to any scholar. After a period of 1d6 months, the whelm sloar will emerge, fully formed from the head of the creator, a process which almost universally kills mortals. Whelm sloars appear as semi-squamous, strangely bachtarian creatures of roughly the same size as an ogre. They occasionally wear exotic clothing belonging to one of the races from the non-existent world from which they hail but just as often they are hideously naked. They are filled with the sum total knowledge of their world, even details never dreamed of by their creator - who was but a visitor to the sloars world. 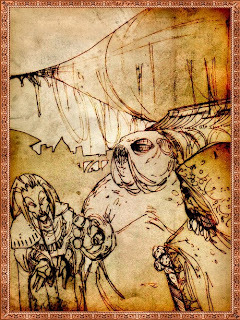 Sloars constantly mutter and gibber bizarrely interesting details about their world and constantly seek sapient creatures to listen to them. Many of the words that issue forth from its mouth are strangely inimical to the human ear, while others are potent and filled with an odd, mythic power. Any creature with an intelligence of 9 or greater hearing a sloar must make a save vs magic device** or be mesmerized by the details of the sloars homeworld. Each round so mesmerized, the must make a new save of take 1d6 points of Wisdom damage. Should a character's Wisdom reach 0, they will transform over the course of 1d6 days into a fanatic sloar (see below). The only way to stop this process is to remove the person from the sounds of the whelm sloars words before his or her Wisdom is depleted. Each time the sloar is encountered, only one save vs magic device must be made, success showing that the potential victim was uninterested in the given topic; however, should the sloar be encountered again, a new save must be made in order to see if the new topic is more interesting. Sloars defend themselves against unmesmerized opponents using their large, meaty limbs or by swallowing them whole. They may swallow any creature man size or smaller, and may only contain one such creature at a time, and the creature inside takes 1d8 damage a round as they are roasted by a strange combination of gases and infernal heat that exists within the sloar's digestive organs. Whelm sloars are only permanently slain if they and their fanatic sloars are killed and the notes of their creator are somehow destroyed in their entirety. As long as any knowledge about the sloars' world still remains in this one, it has the potential to cross over once again. Fanatic sloars are deranged sloar cultists found only in the presence of a whelm sloar or on an errand designated by their hideous master. They appear roughly the same as a whelm sloar, but slightly smaller and they are always known to wear strange and alien clothes, sometimes over the ripped garments of their original body. They possess some part of their master's ability to mesmerize, but may only do so for a single round as they have limits to their grotesque un-knowledge. Characters whose wisdom somehow still reaches 0 due to this attack do not become fanatic sloars unless there is also a whlem sloar present. Otherwise they are simply comatose until the sloars and their world are destroyed. There is a percent chance equal to their intelligence score that the victim was able to remember some of the information from the sloars' world while comatose, meaning that their awakening has only reintroduced the prospect that the sloar might return. Fanatic sloars cannot swallow creatures as can whelm sloars, but do devour rats or similar sized creatures in the same fashion. If its master dies, a fanatic sloar will attempt to recreate him. Each month it has a chance of success equal to the sum total of fanatic sloars working in one area. Should the sloars split up, any sloars who had attempted this summoning but failed in another area will assert the returned whelm sloar doesn't have the magic of the old one and kill themselves. *Sloars are lawful evil regardless of what system is used for alignment, as they come from a non-reality that is alien to all others and thus may break the rules of alignment. **Sloars are, in a strange sense, magical devices themselves, and it is for this reason that the scholars of this world believe they affect victims in that fashion instead of as a spell.